What gets students more invested in their own learning? Many schools struggle to help students remain engaged in school, especially when they are confronted with challenging texts and writing tasks. However, when teachers put students at the center of their own learning—providing frequent opportunities for them to discuss texts, concepts, and their own thinking processes with one another—students boost their critical thinking skills as well as their engagement. This monograph describes how Metropolitan Diploma Plus High School (Metro), a transfer school in Brownsville, Brooklyn, did just that. By focusing on speaking and listening skills, teachers helped students better understand complex texts while also enhancing important critical thinking skills, such as analysis, evaluation, and synthesis. This in turn led to increases in pass rates on state exams in English (+7%) and U.S. History (+16%). This work, spanning 2013–2016, was carried out by a group of teachers across departments at Metro who participated in the Transfer School Common Core Institute (TSCCI), a professional-development initiative led by the NYC Department of Education Office of Postsecondary Readiness. 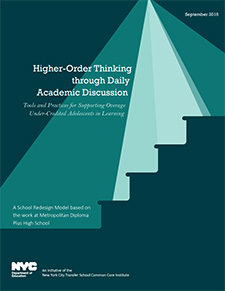 Teachers theorized that if they spent more time engaging students in academic discussions about texts, experiments, and mathematical problems, it would boost students’ critical thinking skills and argumentative writing—and it did. As Assistant Principal Judy Caputo shared, “We knew that if our students could speak about a topic, they would be able to write more critically about that topic…the tools and strategies we developed and piloted through TSCCI have ensured that our students become stronger readers, writers, and thinkers.” With support from TSCCI partners Eskolta and reDesign, teachers developed tools that led to changes in instructional practices in all areas, including differentiation and tracking of student progress on specific skill areas. Students are now at the center of the classroom, and judging by their increased engagement, they like being there. This report provides detailed descriptions of the steps and structures Metro teachers developed to support students’ speaking and listening skills.